The present book is a comparative and evaluative study of Hindu, Christian and Jewish mysticism. 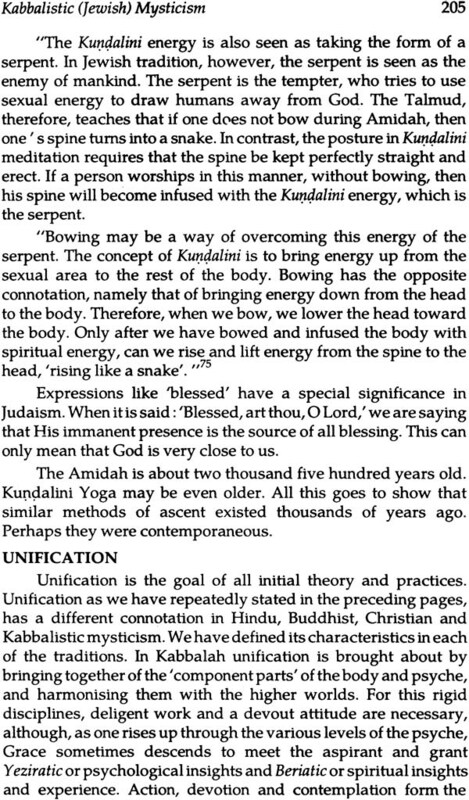 Not much work is done in the field, though there are sketchy studies of any two of these schools and not all together Again the author has taken within his scope, not only the three schools of Vedanta, but has considered the four important Upanisad viz. Isa, Kena, Katha and Mundaka. He has also rightly considered Buddhism. His study of these is through and understanding very clear. He has then dealt with Christianity, with reference to the New Testament and the Christian Mystics. He has drawn on their works copiously. 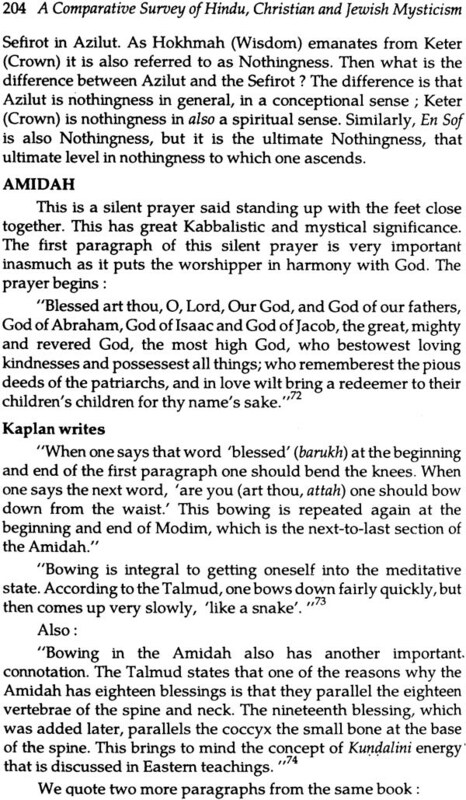 Being a practicing Jew himself, his study of Judaism arid Kabbalah is thorough and gives a complete insight into these religious systems. The most important addition is the study of a great work, “The Cloud of Unknowing” by an unknown author, who appears to be a Catholic Christian and who chose to remain anonymous. 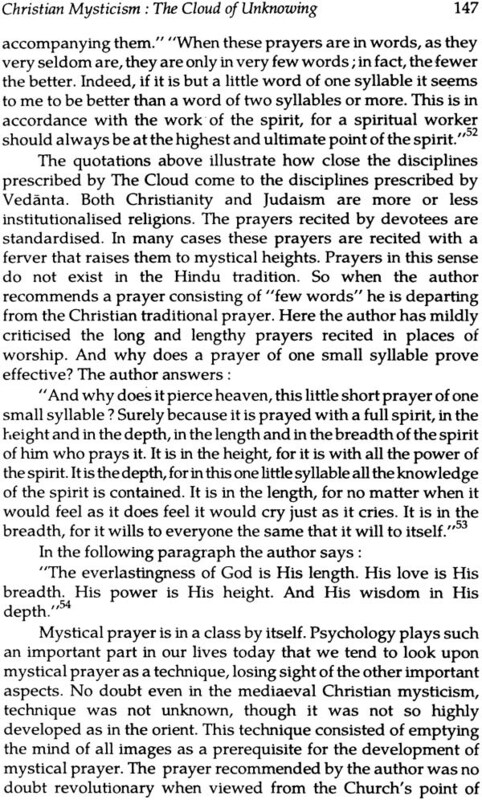 I have gone through the Book ‘A Comparative Survey of Hindu, Christian and Jewish Mysticism’ by Dr. E.M. Abrahams. It is a scholarly and an erudite work. This book is a properly edited and revised version of his Doctoral Thesis. The book is a comparative and evaluative study of Hindu, Christian and Jewish mysticism. Not much work is done in the field, though there are sketchy studies of any two of these schools and not all together. Again, the author has taken within his scope, not only the three schools of Vedanta, but has considered the four important Upanisads viz. Isa, Kena, Katha and Mundaka. He has also rightly considered Buddhism. His study of these is thorough his understanding very clear. He has then dealt with Christianity, with reference to the New Testament and the Christian Mystics. He has drawn on their works copiously. Being a practicing Jew himself, his study of Judaism and Kabbalah is through and gives a complete insight into these religious systems. The most important addition is the study of a great work. 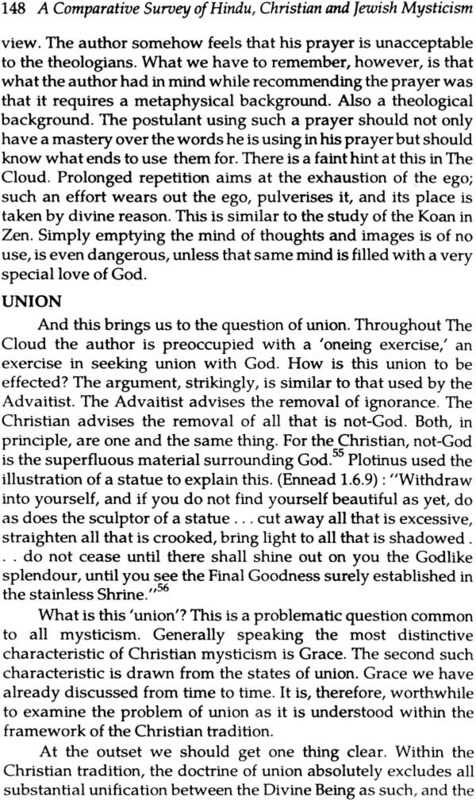 The Cloud of Unknowing’ by an unknown author, who appears to be a Catholic Christian and who chose to remain anonymous, as the religious atmosphere of his days did not permit the freedom of expression he has shown in his work. As a matter of fact, the three middle Eastern religions were not very sympathetic to mysticism, though these religions produced great mystics. Dr. Abrahams has rightly stated during the course of his studies that the quality of mystic/religious experiences, of all great mystics seems to be the same. But the apparent differences, which we find in their expression is due to their metaphysical and theological predilections and traditions. There is a general saying that a Mystic alone can appreciate another Mystic properly. Dr. Abraham’s work is a very good example of this statement. It gives me pleasure to commend this scholarly book to both the Scholars and Commoners. Scholars will find it a very good source book and Commoners will find it highly interesting. This book will inspire them to study further, the other mystics and mystical religious systems, Both will find it illuminating. All said and done, this is a mature work and can be read by all with great advantage. We know only that which our senses perceive, has seemed to many people a matter of common sense. For such people, the perceptual world, the world that we perceive without five senses, is the only world that exists. 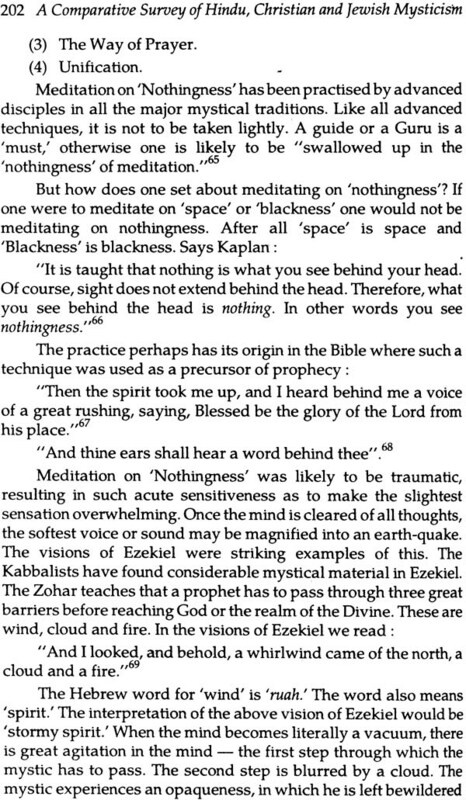 Simple as these statements appear to be, they have formed the basis of great metaphysical problems. How can we know, It Is asked, that which is outside our experience? An obvious and a natural question. But then what do we mean by ‘experience?’ And why should the knowledge of our senses contain the whole of our experience 7 Even if experience is defined as sensuous knowledge, why should there not be other ways of knowing which transcend this form of experience? On the other hand it is contended that the data given by the senses about reality are not valid as it is so strongly influenced by the nature of man and by his perceptual equipment and by his techniques of perception. The mystic believes that by means of special training he can so discipline, tune and train his total organism that It will be able to transcend these limitations and perceive reality more accurately. There is overwhelming consistency In the mystical reports. These have been admirably described by writers and philosophers, who themselves differ from one another in many other ways. William James, W.T. Stace, Bertrand Russell, Evelyn Underhill are a few Instances. For those who care, first hand evidence lies at the core of the Upanisads and such other classics belonging to the major religious traditions of the world. These reports, as do the findings of physics, show that sensory data give at best a very limited picture of reality. The ascetics and sages realised that it was not difficult to master man’s physiological, social, cultural and religious conditionings. The difficulty lay In the area of the unconscious, from what the seers called Samskaras and the Vasanas. The modem psychologist would call these the structures and the contents of the unconscious But even here a significant difference exists between the depth psychology of today and the depth psychology of the seers and ascetics of ancient India. To the latter mere knowledge was not an end in itself. The key word was not “knowing” but “mastering.” They were not interested in “knowing” the contents of the unconscious, as much as burning and rooting them out. 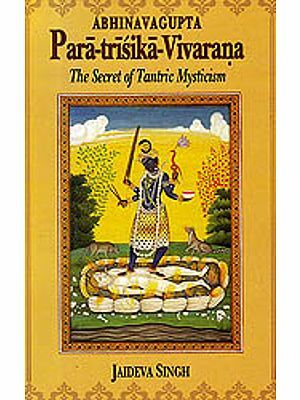 This book pertains to the mysticisms of Hinduism, Christianity and Judaism. If on our journey through these traditions we have strayed and touched upon philosophers like Kant, and Flume, it is because such references are inevitable. Ultimate reality, God, and Mysticism are inseparable. If we have attempted to consider the proofs offered for the existence of God, it is not because the mystic is concerned with proving God’s existence. For the mystic the starting point is the existence of God. There are several approaches to the study of Mysticism: physiological psychological, theological and even literary. Levitation or occultism (ecstatic dancing etc.) would fall within the physiological study. We will mainly be concerned with the claims made by mystics that they had contact with Ultimate Reality which transcends the empirical world. For this purpose we will study those portions of the Upanisads, the Bible, the Kabbalah, the Cloud of Unknowing, which carry the recorded experiences of the mystics. These records show that the mystics speak from the vantage point of knowledge which we, the non-mystics do not possess. Our study will, therefore, face several difficulties. There being no empirical testing method available, one would not be in a position to verify whether the mystic encountered a transcendent reality or that he had the experience on oneness with it. It would be well to remember that when the mystic makes a claim that he has encountered Ultimate Reality or Brahman or God, he Is not trying to prove that God exists. He does not want to put forward his encounter as evidence of the existence of God. It would be absurd to say that St. John of the Cross or St. Teresa or for flint matter Sankara, Ramanuja, or Madhva tried to prove the existence of God or Brahman through their writings. What they tried to do was to direct humanity to the path of mysticism, through contemplative prayer, disciplines and meditation. In fact mystics like St. John of the Cross or the author of the Cloud of Unknowing were addressing not atheists or agnostics but believers. Mysticism, as evidence for the existence of a Reality, a One, which Is transcendent in the sense that it is irreducible to the many, Is relatively a modem phenomenon. One of the reasons for this is that the traditional arguments have met with widespread criticism and people who wanted arguments in support of the existence of God found religious experience to be very useful. Modern man has also realised that living faith can rest only on religious experience. This remark, of course, will be applicable Inure to the Western world than to the non-Western world. As we have raised the question of modem man, it will not be incorrect to say that growing knowledge of non-Western culture and the fact that mysticism has played a major role in oriental religion, has been responsible for turning the Western mind to mysticism. Therefore, It is clear that mysticism has not played an insignificant pint In the meeting of the East and West. The two mystical traditions have, for this reason, to be studied together. Generally speaking, if we exclude the materialistic schools of India, we find that the non-materialistic schools, both Vedic and non-Vedic were preoccupied with the problem of salvation The Vicious circle of births and rebirths had to be broken if man were to attain enlightenment. Enlightenment was just another name for mystics there existed no line of demarcation between Philosophy and religion. The one spilled into the other and vice vets, Mysticism thus constituted the highest common denominator of religion and Philosophy. In the West religion and Philosophy are separate. The mystic, more often than not, operates within the authority of religion. The Eastern seer sets as his goal the Ultimate Subject with which he attempts to identify. The Western mystic on the other hand warts to know about and relate himself to the object both do this through mysticism the phenomenon of mysticism remains the same. Interpretations differ. They differ because the Western and Eastern mystic records them In a different fashion. 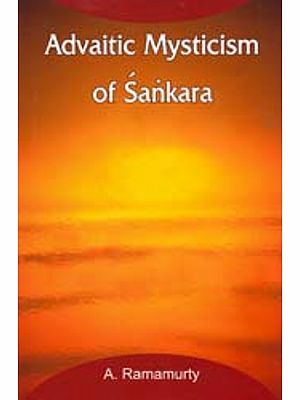 Buddha refuses to discuss the reality of Brahaman or Atman, emphasising the sole reality of Nirvana, the subjective state of mystical the major portion of Sankara’s Philosophy is devote to the discussion of Brahman. For Buddha to maintain that Atman exists is a false view. T0 maintain that Atman does not exist is also a false view. A stable substance is an unreality for Buddha. The upshot is that while one mystic attempts defining the Ultimate Reality, another does not. But all of them are none the mystics. Similarly, the Eastern mystic can declare with impunity that he becomes in his mystical ecstasy what he has actually always been. Maya stood between him and his real self. The Western mystic stops short were he to declare his potential divinity, he would be waned that his experience is related to a God who remains perennially transcendent and separate. The Christian mystic has the sword of cultural environment and Church hanging over him, ready to drop the moment he oversteps the authority of the church. Meister Eckhart who did feel that he had become divine came close to being tried at Avignon Unfortunately for Pope John XXII, who had ordered his trial, Eckhart met with an untimely death. 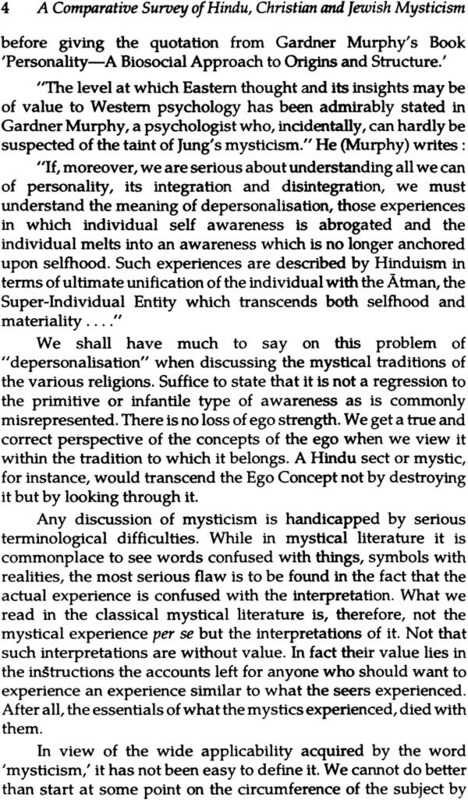 So we see that essentially the mystical experience is the same. Its expression is tempered by the environment, religion and country in which the mystic is born. There is thus considerable scope for the comparison of the mysticism of Hindu, Christian and Jewish traditions. For this purpose it Is vital to examine whether Is a core of teaching running through the major religious traditions. Mystical traditions form the core of all major religious traditions. A doctrinal comparison between two religious traditions often sets the stage for a collision. Similarly, a comparison of ethics Is also ruled out. In many respects ethics becomes relative. What for example is ethical for a Muslim is unethical for a Christian. Historical comparison is also unhelpful. The God of Christianity, like the God of Judaism, acts in history. For the Hindu and Buddhist, such an idea would be unacceptable, for the simple reason that the Hindu and Buddhist mew man in terms of an endless series of births and rebirths. An even in history is of no consequence to him. In the psychology of religion what attracts the attention of the psychologist is not so much the doctrinal, ethical or historical 1inpects, but the mystical. The creative impulse in religion is provided by mysticism. 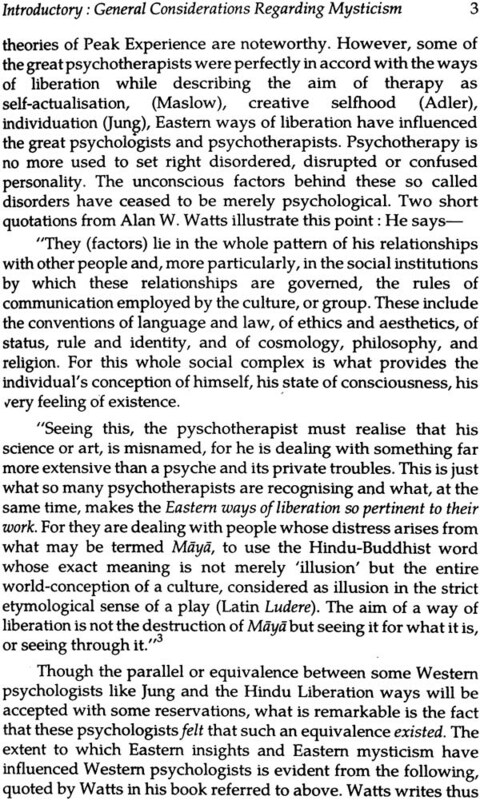 The first thing that arrests the attention of I ii’ psychologist is that the mystical experience is an altered state of consciousness, which culminates in a state, described by the mystic, as union. A theist describes this state as a union with God, non-theist (e.g. a Buddhist) describes it in different terms. But what Is significant is that both theist and non-theist agree on the importance of the experience, which they regard as a perception iii some aspect of Reality. Mysticism for this reason has provided, its we said above, the creative impulse for all religious thought. For those who have studied Hinduism even cursorily it will 1101 be surprising to know that Hinduism is so all encompassing In its varieties of mystical experiences, that by itself alone it contains all the mystical experiences of all the major religious traditions of the world. Looked at dispassionately, Hinduism is a unique synthesis. This fact alone is sufficient to support the view that there is considerable scope for a comparative study of the major religious traditions of the world. In our case, however, we will restrict this study to a comparison between Hindu, Christian and Jewish traditions. For the subject of this book we have chosen mysticism—Hindu, Christian and Jewish. It would not be Incorrect to say simply mysticism unqualified, for in truth, pure mysticism being above and beyond all form and contingency is neither Eastern nor Western, neither Hindu, Christian nor Jewish, but universal. The exterior forms with which It is covered only serve the necessities of exposition, to express whatever Is expressible. These forms may be Eastern or Western. Under the appearance of diversity there is always a basis of unity, at least where true mysticism exists. The only difference is that, except in India, these doctrines are reserved for a relatively restricted and closed elite. To repeat, truth is one, and it is the same for all those who, by whatever way, have attained it. It is possible to define mysticism as we understand it but to define is to limit, and that with which we are concerned is, in itself truly and absolutely unlimited and cannot be confined in any formula. Therefore, though we have attempted a definition, in the ultimate analysis we leave the definition to the great mystics and writers on mysticism. 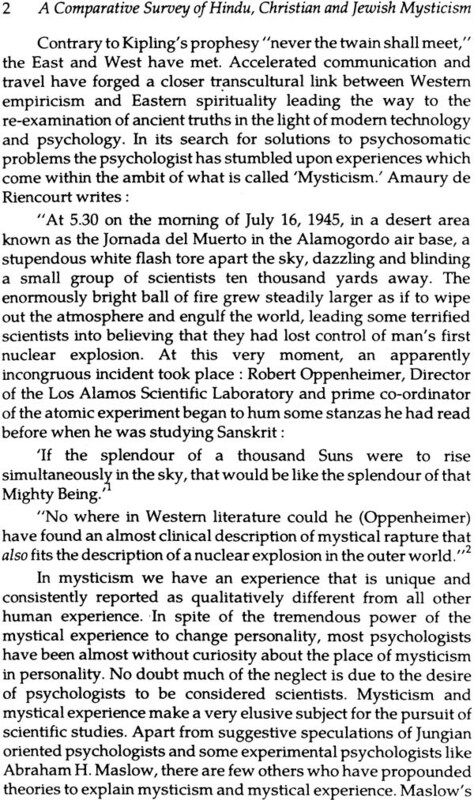 The vast literature on mysticism eloquently speaks for itself. No doubt a study of the writings of the great mystics give us theoretical knowledge. Theoretical knowledge may be indirect and even symbolic, but It serves as a preparation and is, therefore, indispensable for true knowledge. When we talk of knowledge, we do not mean knowledge In the sense in which Aristotle understood it as a knowledge of being qua being. He identified it with ontology. In other words, he took part for the whole. Mysticism demands that man go beyond himself. That is why in all true mysticism It is necessary to take into account the inexpressible. A human being is not a closed system like Leibnitz’s monad—confined beyond remedy, in himself. If this were the case anything outside his own mode of existence would be unknown to him. When, therefore, the word ‘knowledge’ is used, especially by the Eastern mystic (particularly Hindu mystic), it means higher knowledge, metaphysics or even mysticism. For the mystic, knowledge carries its own benefits, unlike action which is momentary. 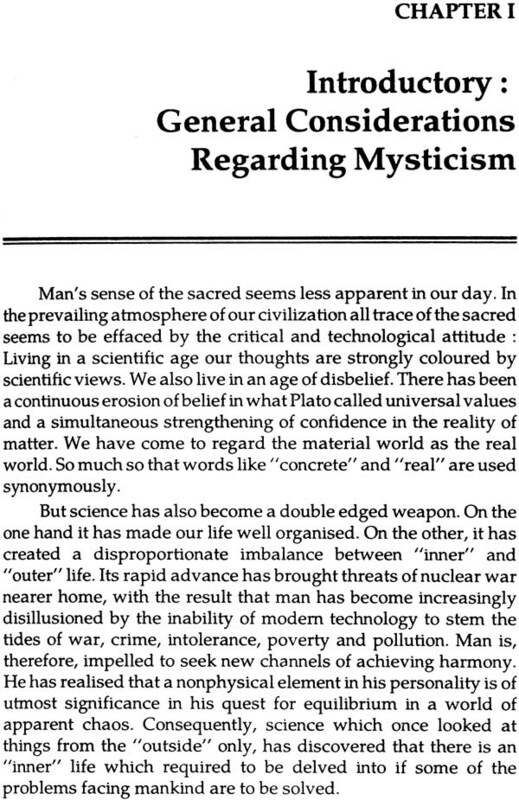 We have tried to show that for mysticism (a general word we use for Nirvana, Enlightenment, etc.) two things are necessary: Method and Wisdom. These are often described an husband and wife, eternally devoted to one another, never to be separated. For this reason method is masculine, wisdom, feminine. Those familiar with Buddhist iconographical symbolism will remember that method is always depicted as a male figure, wisdom as a female figure. The conjugal embrace of these two is often misinterpreted erotically, when actually the Buddhist calls it mystical marriage of wisdom and method. Thus conversion implies grace1 thanks to which one suddenly becomes aware of the futility of one’s present state. This stirs in one an awareness, egging one on to reach a better and happier state. At this stage we ask ourselves What must we do to reach our goal we discern in the distance? This is in fact our prayer for method. We shall see in the mystical writing of mystics belonging to all traditions that wisdom and method go hand In hand as also wisdom is followed by method. Wisdom, in Its abstract form, in an isolated form, will merely lead the mind Into an Intellectual blind alley, a dead end! It will end in pure philosophising. With the dawn of wisdom must come a concurrent means of active verifications? 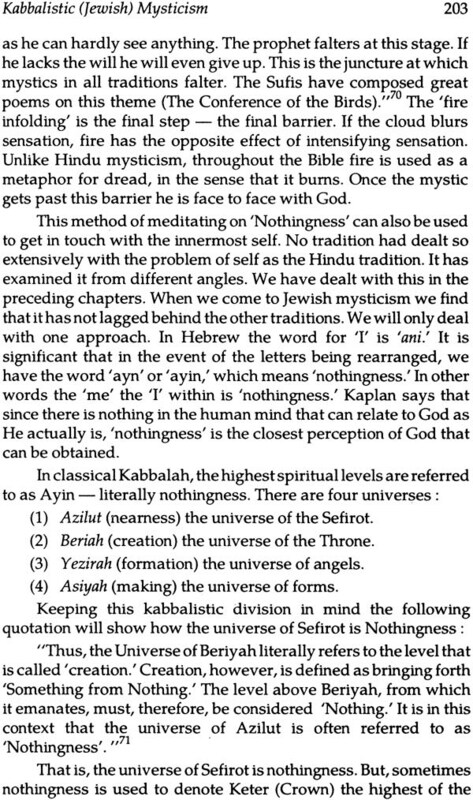 This Is what is provided by mysticism. Tradition is responsible for maintaining a polar balance between theory and practice1 between wisdom and its effective realisation by taking the help of appropriate spiritual means. We can say that wisdom is concerned with knowing and method with being. After all one can only know something being that thing. The proverbial trap of the philosophers is to mistake a mental appreciation of knowledge. for knowledge. There can be no realisation till such time as being and knowing coincide. 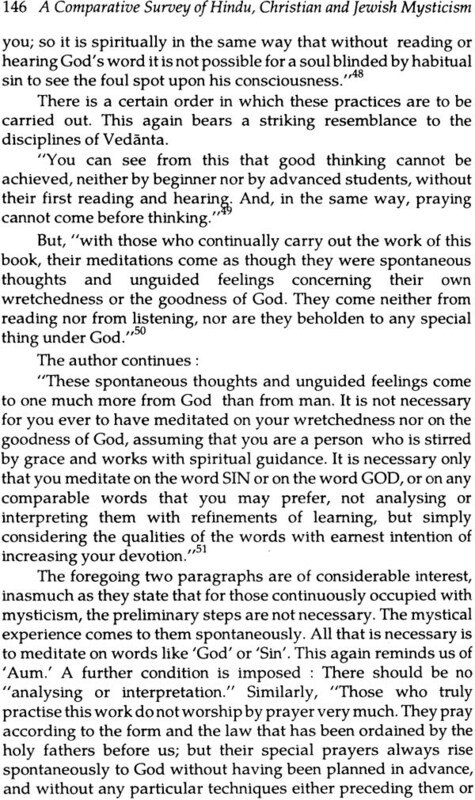 We have tried in the following chapters to apply this criterion to the various traditions and their respective mystics. Sankara, Ramanuja, Madhva, the Buddha, the author of the Cloud, the Seers of the Upanisads and the Kabbalists, all stand this test. The reaction to the negative attitude will be the development of a psychological phenomenon, potentially of great spiritual value “outside the pale of organised religion.” In the event of the latter, it is anybody’s guess how or what shape the positive reaction will take. The attack on Huxley for his radical views is now history. In fact many critics were of the view that Huxley’s greatest output preceded his experimentation with drugs. Thereafter he tended to write about drugs, not to create with them. Huxley, for that matter all those who experimented with drugs, never denied their deliterious effects. 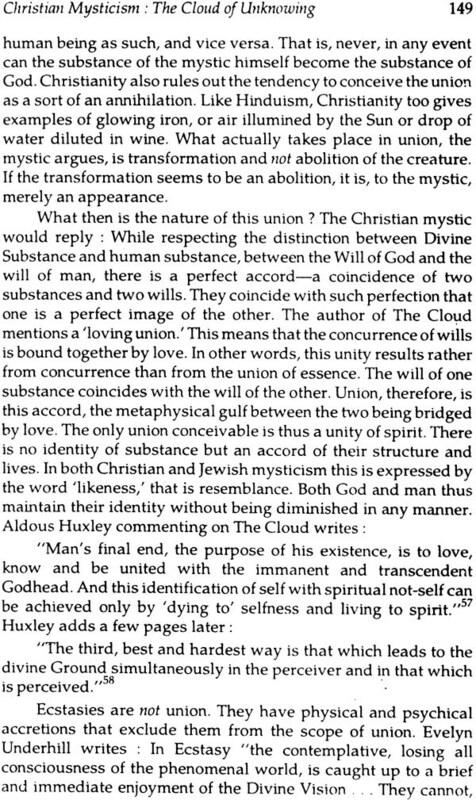 But what Huxley tried to emphasise is that someday religion “from being an activity mainly concerned with symbols will be transformed into an activity concerned mainly with experience and intuition—an everyday mysticism.”5 Will this transformation come about through conventional religion or through psychedelics? This is a thousand dollar question which defies an answer at the present juncture.